Outside the Spring Lake Park Dairy Queen. 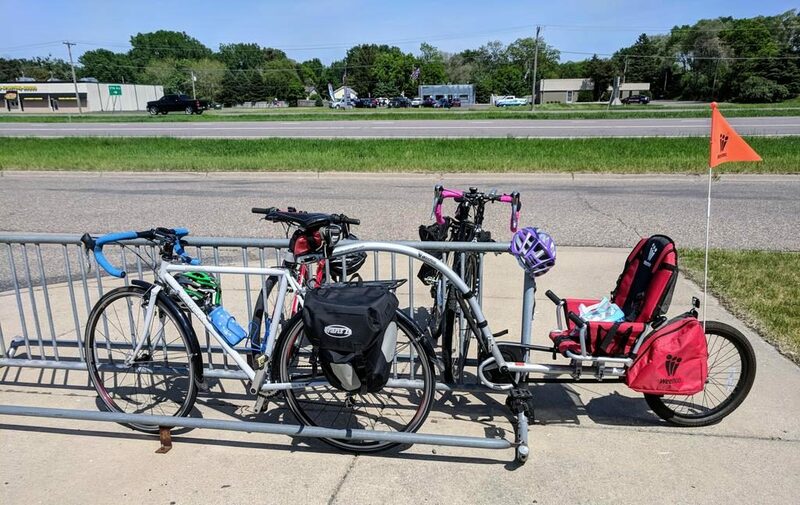 Current bike line up are a black Surly Cross Check (with the pink bar tape), a grey Surly Cross Check with a Weehoo bike trailer, and a jolly red Specialized Hot Rock for the elder child. For all this image is in front of Central, the ride to this DQ is nice – mostly lower-traffic road with shoulder, and a cut through via a park trail alongside a lake that smells of lilacs right now. The cyclist was headed westbound, straight, per witnesses. The bus was turning left. The students on the bus saw the cyclist lying bleeding in the street near the bus’ front bumper. Did the cyclist run the red light? 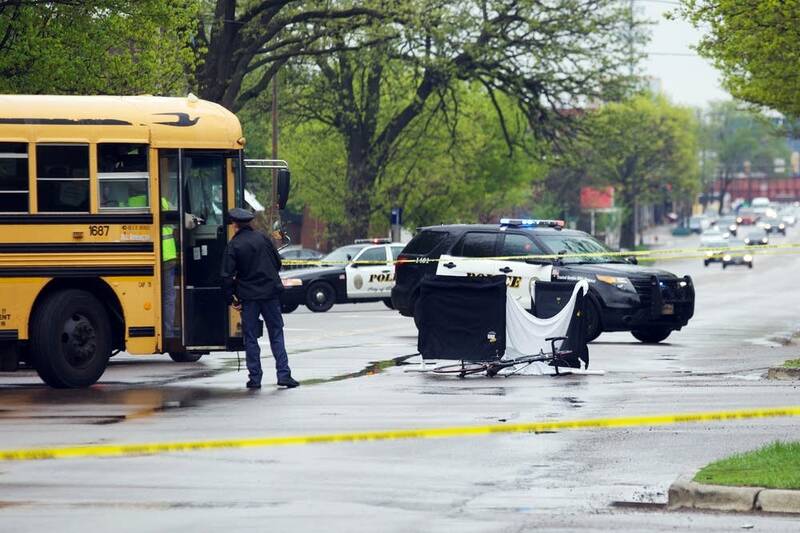 Per pictures in articles covering the crash, the cyclist was hit by a flat-front bus. A flat-front bus is also known as a Type D bus. It typically is over 10,000 pounds gross weight, and generally between 10 and 11 feet in height. The picture above gives a sense of scale compared to the nearby police SUV. The bus driver will be looking over most vehicles in traffic. If you are hit by a flat-front bus, accelerating through a left turn, a helmet is the least of your worries as a cyclist. You are not going to die from the head wound. You are going to die of blunt force and internal injuries to your torso. It doesn’t take experience in trauma, in collision science, or even a passing grade in high school physics to realize this. A recent study by the Insurance Institute for Highway Safety found that SUVs, with high-riding style, flat front ends, and higher total horsepower are likely to strike pedestrians higher on victims’ bodies — at the chest rather than in the legs — and strike with more force. And they’re smaller than these buses! There is plenty of history in this intersection, including a 2009 death and a 2014 crash leading to long-term rehab. Plenty of questions can be asked from this history. The articles I have read so far all neglect to even mention the past. I like bike helmets. They are often useful. But they shouldn’t be in the first 25 concerns anyone has about this particular collision. Stop wasting media briefing time on the helmet question. Stop pretending that helmets save lives in these situations, because they don’t. And let’s figure out how to stop these deaths from happening, again and again. But the good news is I have the Event Calendar operating again! Updates are ongoing, but May and June are (mostly) fleshed out, with public meetings being the next stuff to be added. On a 6-1 vote on August 3, the Blaine (MN) City Council approved an actual high-density housing development. As of 11 days later, the world hasn’t ended (even if there are signs it’s trying to get there). Of course, there are caveats to how this unlikely thing occurred after years of bizarre hand-wringing over putting high-density housing in other locations, like in The Lakes development. 1. The site is next to a Gun Club. Arguably, this is not where you want your next golf course community, am I not right? 3. Beyond the senior housing component, there are few specifics about the 32-acre development yet. 4. They somehow believe they’ll get the magic new grocery store some council members want on the site as part of the retail component, even though there’s already a Super Walmart, an Aldi and a Cub right there. 5. Did I mention the Gun Club? There was also concern about the lack of mass transit near the site, as though that isn’t true for pretty much everywhere in Blaine. Nonetheless, it is good to see that Blaine realizes that we need some higher density development. Even if it has to be via putting affordable senior housing next to the Gun Club. (Note: They’d also talked about putting a K-4 school next to the Gun Club, which obviously was also a great idea.) Next thing you know, they’ll build sidewalks, and we’ll have an explanation for the crumbling of society’s foundations.